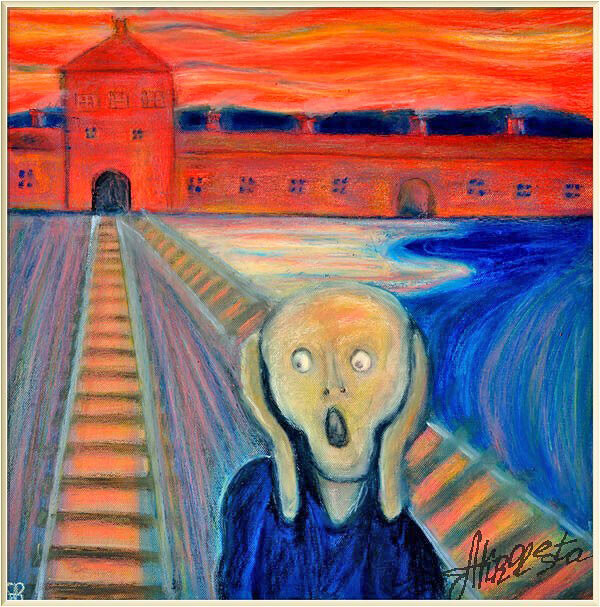 A man from the painting of Edvard Munch looks around ... and sees the gates of the death concentration camp of Auschwitz. In the foreground of the picture is a figure from the painting of Edward Munch's "Scream". In the background is the entrance to the concentration camp of Auschwitz. "The Scream (Norwegian: Skrik) is the popular name given to each of four versions of a composition, created as both paintings and pastels, by Norwegian Expressionist artist Edvard Munch between 1893 and 1910. The works show a figure with an agonized expression against a landscape with a tumultuous orange sky. Arthur Lubow has described The Scream as "an icon of modern art, a Mona Lisa for our time." Edvard Munch created the four versions in various media. The National Gallery in Oslo, Norway, holds one of two painted versions (1893). The Munch Museum holds the other painted version (1910) and a pastel version from 1893. The fourth version (pastel, 1895) was sold for $119,922,600 at Sotheby's Impressionist and Modern Art auction on 2 May 2012 to financier Leon Black, the fourth highest nominal price paid for a painting at auction. Auschwitz concentration camp was a network of concentration and extermination camps built and operated by Nazi Germany in occupied Poland during World War II. It consisted of Auschwitz I (the original concentration camp), Auschwitz II–Birkenau (a combination concentration/extermination camp), Auschwitz III–Monowitz (a labor camp to staff an IG Farben factory), and 45 satellite camps. Auschwitz II–Birkenau went on to become a major site of the Nazis' Final Solution to the Jewish Question during the Holocaust. From early 1942 until late 1944, transport trains delivered Jews to the camp's gas chambers from all over German-occupied Europe, where they were killed en masse with the cyanide-based poison Zyklon B, originally developed to be used as a pesticide. An estimated 1.3 million people were sent to the camp, of whom at least 1.1 million died. Around 90 percent of those were Jews; approximately one in six Jews killed in the Holocaust died at the camp. Others deported to Auschwitz included 150,000 Poles, 23,000 Romani and Sinti, 15,000 Soviet prisoners of war, 400 Jehovah's Witnesses, and tens of thousands of others of diverse nationalities, including an unknown number of homosexuals. Many of those not killed in the gas chambers died of starvation, forced labor, infectious diseases, individual executions, and medical experiments. As Soviet troops approached Auschwitz in January 1945, most of its population was sent west on a death march. The prisoners remaining at the camp were liberated on 27 January 1945, a day now commemorated as International Holocaust Remembrance Day. In the following decades, survivors such as Primo Levi, Viktor Frankl, and Elie Wiesel wrote memoirs of their experiences in Auschwitz, and the camp became a dominant symbol of the Holocaust."